I just had to post this link - talk about a girl who can ride. 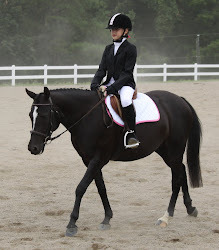 This is the Young Rider National Champion - this horse is amazingly talented but a complete handful. She does an unbelievable job, and even with this craziness in the middle of this test, she deserved the championship - the most beautiful rides!!! So, check out Meagan the rodeo queen and see how she recovers beautifully and finishes the ride with such composure!! I'm going to be watching out for them in the future - great things to come! There's a duck in our house! !